A delicious blend of fresh organic and high quality ingredients with plenty of vegan and gluten free options. Prawns marinated in sweet chilli sauce, baby spinach, feta, onion and mozzarella on a base of Savvy's homemade sweet chilli sauce. Prawns, anchovies, kalamata olives, tomato and mozzarella on a base of Savvy's homemade Napoli sauce. Mildly spiced salami, jalapeno chillies, mushroom, roasted red capsicum, kalamata olives, onion and mozzarella on a base of Savvy's homemade Napoli sauce. Tomato, oregano and mozzarella on a base of Savvy's homemade Napoli sauce, garnished with buffalo mozzarella. Caramelised onion, anchovies, kalamata olives and mozzarella on a base of Savvy's homemade Napoli sauce. Baby spinach, mushroom, feta, cherry tomato and mozzarella on a base of Savvy's homemade Napoli sauce. Free range chicken, roasted zucchini and eggplant with mozzarella on a base of Savvy's homemade sweet chilli sauce, garnished with buffalo mozzarella. Baby spinach drizzled with balsamic glaze, roasted pumpkin, feta and mozzarella on a base of Savvy's homemade Napoli sauce, garnished with pine nuts. Mildly spiced salami, free range ham, bacon and chicken, onion and mozzarella on a base of Savvy's homemade smoky BBQ sauce. Anchovies, kalamata olives, feta and mozzarella on a base of Savvy's homemade Napoli sauce. Roasted eggplant, pumpkin, zucchini and red capsicum, caramelised onion and mozzarella on a base of Savvy's homemade Napoli sauce, garnished with buffalo mozzarella. Prawns, baby spinach, onion, cherry tomato and mozzarella on a garlic paste base. Baby spinach, jalapeno chillies, onion, chilli flakes and mozzarella on a garlic paste base. Free range chicken and bacon, pineapple, onion and mozzarella on a base of Savvy's homemade smoky BBQ sauce. Free range ham and bacon, pineapple and mozzarella on a base of Savvy's homemade Napoli sauce. Free range ham and bacon, mushroom, kalamata olives, anchovies, onion and mozzarella on a base of Savvy's homemade Napoli sauce. Pineapple, baby spinach and mozzarella on a base of Savvy's homemade sweet chilli sauce. Mildly spiced salami, free range ham and bacon, mushroom, kalamata olives, anchovies, pineapple, onion and mozzarella on a base of Savvy's homemade Napoli sauce. Free range ham and bacon with mozzarella on a base of Savvy's homemade Napoli sauce. Mildly spiced salami, anchovies, cherry tomato and mozzarella on a base of Savvy's homemade Napoli sauce, garnished with buffalo mozzarella. Garlic and olive oil paste seasoned with salt flakes and topped with mozzarella (even better with anchovies). Oregano and Savvy's homemade Napoli sauce topped with mozzarella. Savvy's homemade sweet chilli sauce topped with mozzarella. Baby spinach, roasted zucchini, tomato, onion and soy mozzarella on a garlic paste base. Roasted pumpkin and red capsicum, pineapple, baby spinach and soy mozarella on a base of Savvy's homemade sweet chilli sauce. 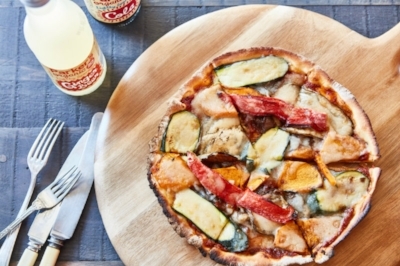 Roasted eggplant, pumpkin, zucchini and red capsicum with caramelised onion and soy mozarella on a base of Savvy's homemade Napoli sauce. Mushroom, roasted pumpkin, eggplant and zucchini, pineapple, kalamata olives, onion and soy mozarella on a base of Savvy's homemade Napoli sauce. Jalapeno chillies, mushroom, roasted red capsicum, kalamata olives, onion and soy mozzarella on a base of Savvy's homemade Napoli sauce. Lots of mushroom, lots of baby spinach, cherry tomato and soy mozarella on a base of Savvy's homemade Napoli sauce, garnished with pine nuts. Baby spinach, jalapeno chillies, onion, chilli flakes and soy mozzarella on a garlic paste base. Garlic and olive oil paste seasoned with salt flakes and topped with soy mozzarella. Oregano and Savvy's homemade Napoli sauce topped with soy mozzarella. Savvy's homemade sweet chilli sauce topped with soy mozzarella. Our pizza bases are made using Biodynamic flour. Gluten Free bases are also available (large only). As well as the Vegan Pizza menu, all Vegetarian pizzas (from the main menu) are available without cheese or with soy mozzarella, please specify requirements when placing order. See also our range of non dairy frozen desserts and sorbets. All our ham, bacon and chicken is free range and all meat products are hormone, chemical & gluten free. Available in 500ml tubs, 150ml cups or 5 litre catering tubs (by special order). See the Ice Cream tab for our delicious flavours and prices.